Calculated at 51% of Federal tax which has been reduced by the $266, a further realisation results in $136 for a total federal and BC tax credit of $402. Gifts of certain appreciated capital property have special rules and in some cases such gifts may be more beneficial to the taxpayer than those in cash. In general, the credit or the deduction in based on the market value of the property and only one-half (normal 75%) of the taxable capital gain is included in income. Donations in excess of the annual limit may be carried forward and used in any of the five subsequent years. To donate, please mail your cheque payable to the Government House Foundation and send to the address below. Please note on your cheque that you wish your donation to be used for the libraries. Alternatively, you can call the Foundation office at 250-356-1829 and put your donation on your credit card. All donations are eligible for a tax receipt according to Canada Revenue Agency regulations. For more information about the Foundation, please visit www.bcgovhousefoundation.ca. 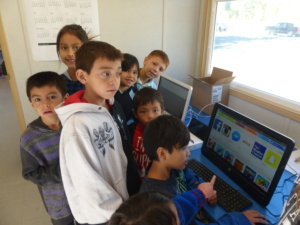 The Write to Read Project builds libraries in remote communities across British Columbia. Each library costs approximately $50,000 depending on the remoteness of the community in which it is built and the design which works best for the community. While the trailers, books and computers are donated in kind, funds are needed for transportation, installation, furniture and equipment, sustainability and communications (Internet fees, fibre optic monthly costs). The first dozen libraries were made possible by the donation of 12X42-foot modular buildings by Britco Structures. They were trucked or barged to communities in the interior or coast. That inventory is now depleted, so W2R is now designing new structures that will be delivered in sections and assembled on site by volunteers. To date, all materials have been donated “in-kind” and all work done by volunteers. 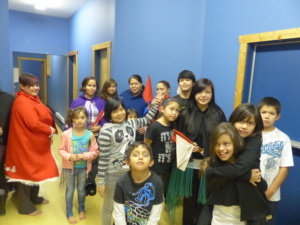 There are over 500 schools on First Nations reserves in Canada. Provincial schools are paid more than double than reserve schools for student tuition. Over the past decade funding for on-reserve schools increased 19 per cent, provincial school funding 45 per cent. 58 per cent of First Nations youth living on reserve have not completed their secondary education. There is no funding for on reserve school libraries or books or vocational training. 54 per cent of all Aboriginal children are in the care of government agencies! 90 per cent have no access to early childhood education. A recent study calculated that $70 billion would be added to Canada’s economy if Aboriginal people attained the same educational levels as other Canadians. There is a simple solution to changing this crisis. It’s called literacy. Nothing changes a community faster or better in the long term than access to learning. W2R is now designing Learning Centres through the installation of fibre optic wiring, where possible. This allows for Long Distance Learning and Tele-conferencing, allowing teens and adults alike to gain certificates in specific skills and trades. In Kyquot, W2R is now planning to build a Community Centre with a Learning Centre, gym, meetings rooms and kitchen. Logs and timber for the construction will be cut and milled right on site, allowing community members to gain skills and experience in construction. The cost of this project is $5-$8 million, depending on final design. To date, installation of libraries in participating communities has instituted immediate and profound social change. Children have a safe place to go, literacy has increased dramatically and computer skills have been applied to a wide variety of student projects. Goals and targets have been set for children who formerly had few or none. Hope for a better future is now a tangible reality for the economically disadvantaged instead of a dream. Next steps may include eco-tourism jobs and computer employment. The Write to Read Project is administered by Government House in Victoria, the offices of the Lt. Governor. Government House does not provide funding for W2R staff, but tax receipts are available for any amount sent as a “gift to the Crown,” no matter the amount. Every dollar goes towards expanding the scope of the project; dozens of other First Nations communities have requested our assistance. Our goal is to build a library in every First Nations community in BC, and to inspire other provinces to replicate our model. To get more information about ways you can help, please use the Contact page of this website. No books please, we have far more than we can use. Please inquire also about donations of computers, tablets, fibre optic costs, cameras and cash. To donate, please mail your cheque payable to the Government House Foundation and send to the address below. Please note specifically on your cheque that you wish your donation to be used for the libraries. Alternatively, you can call the Foundation office at 250-356-1829 and put your donation on your credit card. All donations are eligible for a tax receipt according to Canada Revenue Agency regulations. For more information about the Foundation, please visit www.bcgovhousefoundation.ca.